Furama Villas Danang has become the only Villa project in Vietnam to win “Luxury Beachfront Villa” at the prestigious World Luxury Hotel Awards. 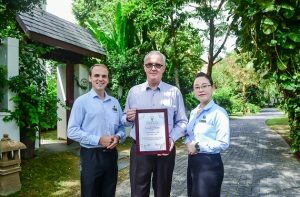 Since 2006, the annual World Luxury Hotel Awards has served as the global recognition of hotels’ sustained commitment to service excellence and outstanding achievement in the international luxury hospitality industry, receiving over 300,000 votes from international travellers and leading tourism experts in their annual poll. Furama Villas Danang is part of the Ariyana Tourism Complex, including 198-room Furama Resort, Furama Villas, the upcoming 1000 room-key Ariyana Beach Resort & Suites project, and the high-profile Ariyana Convention Centre, where a week-long series of APEC 2017 events was held. 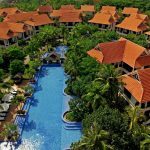 The 131 luxury villas with views of the pristine white sand beach, sharing architectural similarities with Furama Resort, and connects to the resort to form a “tropical peaceful haven” within the city centre. Mr. Matthias Wiesmann, General Manager of Furama Resort & Villas Danang opined: “We feel honoured to be Vietnam’s only Villas project that was granted this award. The 3rd award from World Travel Awards will be a benefitting award for the whole Ariyana Tourism Complex, contributing more to the Danang’s hospitality fame”. This year, Furama Resort has also won “Most Favored Hotel” Jalpak Award 2017 by JALPAK Japan, “Golden Dragon Award” and “The Guide Awards” by Vietnam Economic Times and Ministry of Planning and Investment.